Wide open skies, green fields, glimpses of rich dark soil between the rows: I soak up the landscape, marveling at the God who made it. No music plays. No phone calls are made. Instead I relish the silence. And I realize I’m content to be alone with my thoughts, content to pray, content to slow down and listen. This is a gift of grace. Though I love music in the car, I’ve learned to be comfortable with silence. When my heart is quiet, I can meet with God. Thank you, Lord, for wind and rain. Thank you for suffering. Thank you for seasons of refreshment. Thank you, Lord, for life. My heart floods with peace and grace quantifiable. I’m happy. It’s a moment in time void of struggle. Words like security, stability, protection, and joy spring to mind. These are the mercies of God, flowing from His heart to mine. He protects. He secures. A heart guarded, a running conversation between God and me, we pick up where we left off. Solitude is word that speaks peace to some, dread to others. In my life, it extends beyond a quiet country drive. God has taught me how to be alone. He has transformed solitude to prayer. In past days solitude would have been a different word, however. When half of me was ripped away, I knew a loneliness that permeated every interaction, every worship service, every evening by myself. “Alone” felt like a curse word. Loneliness was a profound ache at the core of my heart that sometimes made me feel crazy. Over time, I poured loneliness into pages and pages of prayer. Talking to God began to be like breathing– constant and necessary. Prayer was no longer a short chunk of time, but blossomed into flowing streams of conversation with the One who made me. Yet again a gift of grace. And therein lies the catalyst, Jesus satisfies. If I have Jesus, I have all I truly ever need. 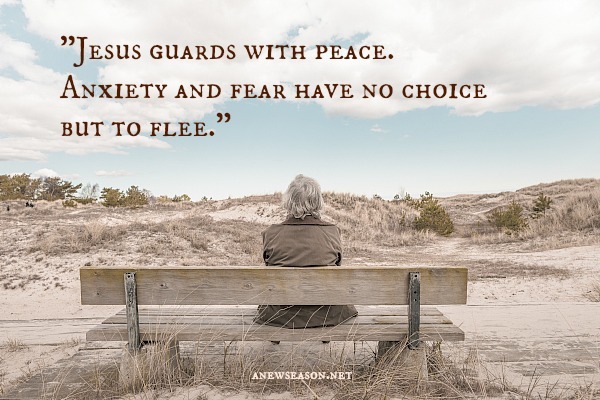 Peace emanates from Christ. Like everyone else, sometimes worry and anxiety barricade peace, but today belief affects actions. Because Jesus satisfies, loneliness gives way to solitude. 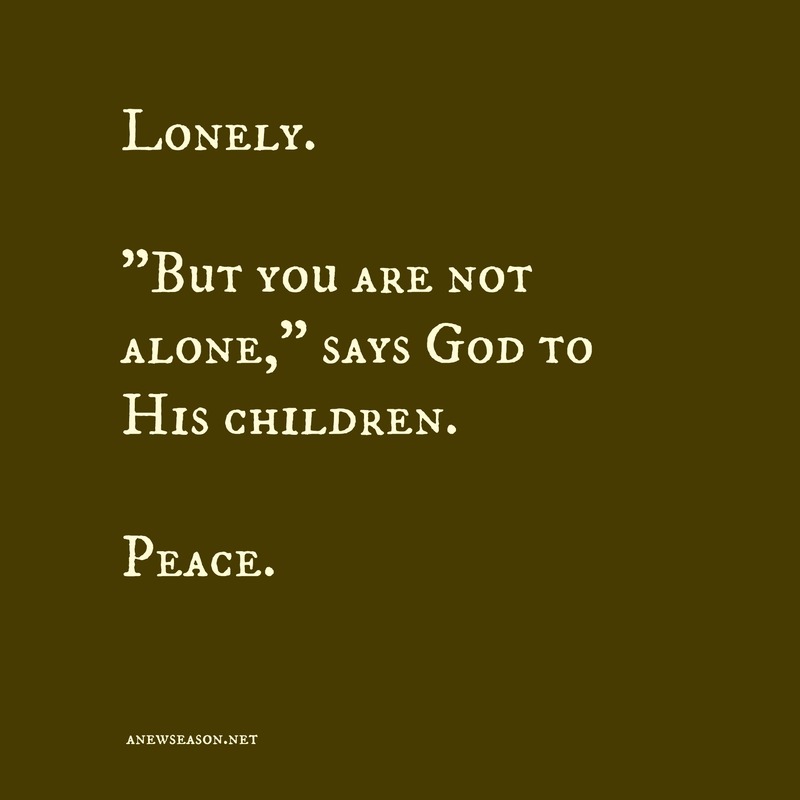 And solitude is fertile ground for time with God. Conversation with Him reflects a mind “stayed on” Him. And He guards my heart. Anxiety and fear have no choice but to flee. People and things temporarily fill the space called “lonely,” but at the end of day, I’m left with a vessel that leaks. But “lonely” filled with Christ is a cup that never leaks, overflowing and inundated. Jesus, you satisfy. By grace I know it to be profoundly true. Draw me ever closer to you. Fill me with you, for you obliterate loneliness. Teach me to embrace solitude as a catalyst to prayer. When my heart is afraid, anxious, or worried, lead me back to peace that surpasses understanding. Guard my mind with you. < Previous Hate will not win. Next > Sometimes I still have nightmares.